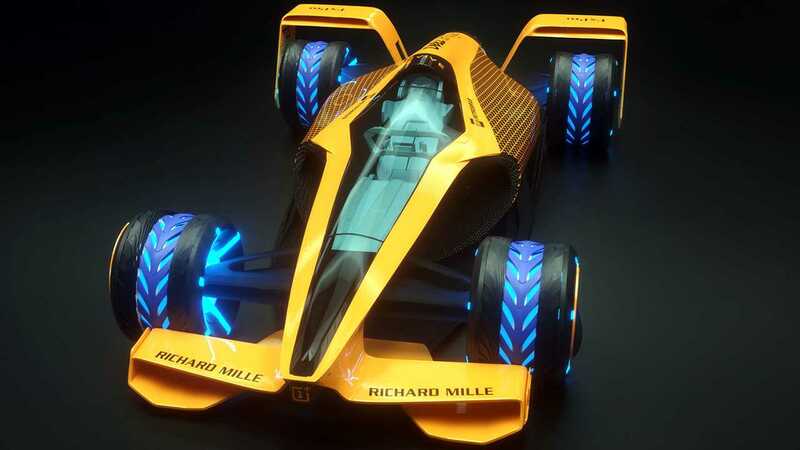 McLaren Applied Technologies has envisioned the future of Formula 1 come 2050, and as is made clear by the pictures, it's full of ridiculously high-tech innovations that make today's multi-million dollar machines look like Toyota Corollas. The cars themselves, in this case, are fully electric but don't suffer from any range restrictions. McLaren predicts that the racers will be able to "refuel" via inductive charging and a high-density battery pack, not only allowing the cars to easily complete a full race distance but also achieve almighty top speeds of over 300 miles per hour. That ludicrous velocity can also be attributed to wild active aerodynamics that go beyond the comparatively simple idea of current drag reduction systems (DRS) and into shape-shifting, Transformers-like adaptability. MAT anticipates F1 cars will be able to retract parts of their bodywork to decrease drag on the straights, then deploy them prior to the corners in order to reach massive amounts of grip. Due to these drastically improved capabilities, McLaren predicts that new circuits will need to be configured in order to fully display the cars' go-fast aptitude. Tracks with high banking, impossibly tight turns, and complex visibility aids for the fans could amp up the excitement while also allowing the crowd to view all the on-track action. 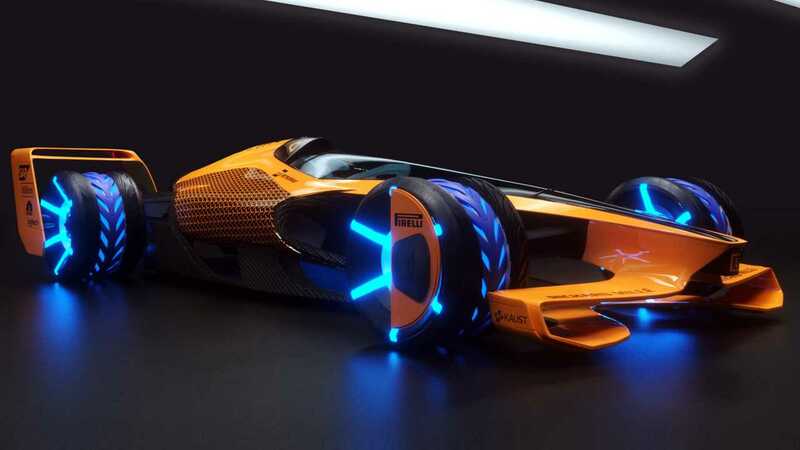 Though McLaren didn't include autonomy as part of its vision, it did conceptualize an artificial intelligence (AI) aspect that's integral to the drivers' performance. This futuristic assist will be intertwined into both the race suits and pit wall to give drivers and their teams cutting-edge insight. As for the drivers, the self-learning AI will feed them information through visor-incorporated displays while keeping track of data such as battery charge, damage, and tire wear (though future compounds will be self-healing, according to MAT). The AI will then work in collaboration with team members in the pits to create precise strategies while making finely tuned suggestions based on real-time info. "In the future, we could get to the point where human ingenuity is replaced with an AI algorithm," says head of Modeling and Decision Science at MAT, Karl Surmacz. "Machine learning would see human preferences and decisions, as well as our domain expertise and instinct, captured. Take enough examples of our creative processes and outcomes, and this could be codified into an algorithm which would enable AI to make creative decisions consistent with those of a human counterpart."